Can Robo-Investors Protect Their “Nest Egg” During Down Markets? 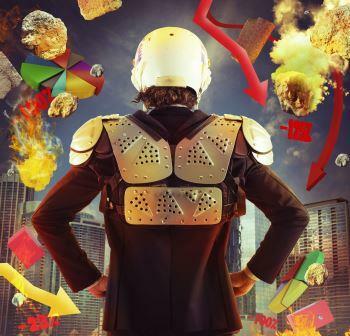 Robo-investors may be appealing to those who believe the "trend is their friend" and "past performance can be a guarantee for future performance”; however, these are two terms that experienced investors know are temporary in nature and inherently incorrect. First, the quick risk-profile survey performed by these robo-investors could make them unable to create customized financial models that focus on each individual’s cash flow, complete risk profile analysis, retirement planning, insurance requirements, mortgaging, tax planning, and college funding. Robo programs tend to take a quick snapshot of an individual’s profile rather than a comprehensive analysis and deep dive into each client’s specific needs throughout their entire life cycle. Second, due to their unproven track record during market downturns, these robo-investors could likely follow their trend trading models and end up selling all shares without consultation with investors; thereby, leaving clients regretting investing with robots once markets rebound. Third, robo-investors, for the most part, invest in exchange-traded funds and well-known indexes, essentially preventing investors from trying to find pockets of value in underlying individual securities. In addition, robo-investors tend to only perform a broad market allocation analysis. Robots, in general, cannot identify individual equities, and bonds that trade at discounted valuations to market indexes. These are the tools, that more often than not, can help individuals to somewhat isolate themselves from broad market declines, credit, and interest rate risks. When markets do adjust, how equipped will the robots be to identify long term, undervalued individual investments? Large size purchases are normally more expensive than odd lot purchases. In our view, there is more interest rate risk in shorter term bonds (Up to five years to maturity) as opposed to midterm bonds (10 to 14 years to maturity). When short term interest rates eventually will start rising (Controlled by the FED), there is a heightened potential that longer term rates (Controlled by the open market) will start declining in anticipation of slower economy (Resulting in: a Flat Yield Curve). Try to avoid at all cost buying inventory bonds which are possibly marked up. Be prepared for Bond Fund companies liquidating Municipal Bond positions of all types due to redemption requests and potentially, PUERTO RICO IMMINENT DEFAULT. Look also at "kicker Bonds"; Municipals, that have a short call protection of 1 to 3 years; however, if not called kick to an attractive longer yield to maturity of 4% or better, exempt at least from Federal Taxes. Tamar Securities, LLC is a Registered Investment Adviser. These opinions are presented solely for informational purposes. Advisory services are only offered to clients or prospective clients where Tamar Securities, LLC and its representatives are properly licensed or exempt from licensure. Past performance is no guarantee of future returns. Investing involves risk and possible loss of principal capital. No advice may be rendered by Tamar Securities, LLC unless a client service agreement is in place. For a while, investors wished for the Federal Reserve Board not to raise rates, however, at this point the Fed is stuck between a rock and a hard place. Why is that? Because if rates don’t rise as the market wishes, then the Federal Reserve Board will have to explain the reasons for not raising rates. Such reasons could include employment weakness, lackluster GDP and inflation growth at home, heightened volatility risk, emerging markets’ meltdown, commodities selling route, slowing Chinese economy, and currencies’ devaluation around the globe. On the other hand, the reverse might happen if the Federal Reserve Board does end up raising rates by year’s end. This in turn, will have the Federal Reserve Board pointing out the positives in the U.S. economy and global markets. Such positives might include fundamental economic improvement toward full U.S. employment, inflation rates closing in on the Fed’s preferred 2% annual rate, and positive GDP growth rate at home. Therefore, global financial markets need to be mindful of what they wish for… The right recipe just might be a one-off marginal interest rate increase before year-end to go along with positive sentiment on the U.S. economy by the Federal Reserve Board. In this scenario, investors should position themselves to take advantage of a likely increase in market volatility by anticipating improved economic conditions by year-end in the U.S. and foreign markets alike. For additional information, please contact us at 818-914-7460 or at info@tamarsecurities.com. The commentary on this website reflects the personal opinions, viewpoints and analyses of the Tamar Securities, LLC employees providing such comments, and should not be regarded as a description of advisory services provided by Tamar Securities, LLC or performance returns of any Tamar Securities, LLC Investments client. The views reflected in the commentary are subject to change at any time without notice. Nothing on this website constitutes investment advice, performance data or any recommendation that any particular security, portfolio of securities, transaction or investment strategy is suitable for any specific person. Any mention of a particular security and related performance data is not a recommendation to buy or sell that security. Tamar Securities, LLC manages its clients’ accounts using a variety of investment techniques and strategies, which are not necessarily discussed in the commentary. Investments in securities involve the risk of loss. Past performance is no guarantee of future results. When Markets Are Down, Who You Gonna Call? Robo-Busters? Can you recall what happened on the week of October 6, 2008? 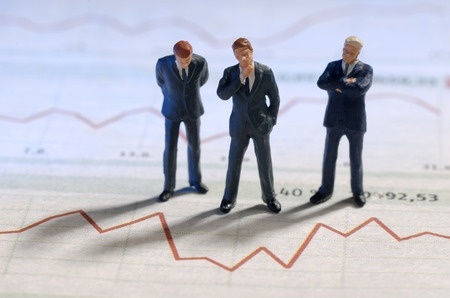 That week the Dow Jones industrial average fell 1871.33 points or 18% while the S&P 500 dropped 198.34 points or 18%.1 Panic was rampant on Wall Street and investors witnessed their retirement funds dwindle by the hour. So what changed today in Financial Markets? Not a lot. iEuropean stocks fell as Greece deferred on a debt repayment, German bonds extended declines in their worst week since 1998, and their 10 year bunds climbed to 0.87%. Treasuries dropped, and yields on the 10 year Treasuries increased three basis points to 2.34% iiwhile the nonfarm payrolls reported to rise by 280,000 jobs in May compared to the Bloomberg forecast of 226,000 increase. The unemployment rate moved higher to 5.5% from 5.4%, iiiand the labor participation rate ticked a tiny bit higher from 62.8% to 62.9% ivwhile the Organization of the Petroleum Exporting Countries (OPEC) expectedly left its output level unchanged at 30 million barrels per day. In my view, this is a lot of data about nothing new as to the direction of interest rates in the near future. Financial markets, in essence are like little “babies” that like to throw tantrums when the future is unclear. This in turn, breeds volatility which brings opportunity. Professional speculators might point out, that from now to the end of the year pundits across the spectrum are likely to flip flop on the strength of the labor market and the U.S economy in general due to inconsistent financial data. In that case, any weakness in bond and stock markets alike might be exaggerated; and therefore, should be used as buying opportunities. Why Invest in a Volatile Market? Uncertainty breeds volatility and volatility breeds uncertainty. This is the vicious cycle financial markets should expect from now to the end of 2015. Investors should be aware of heightened bond, stock, commodity, and currency market volatility, mostly as a result of interest rate uncertainty. This year’s gains in global bonds evaporated. 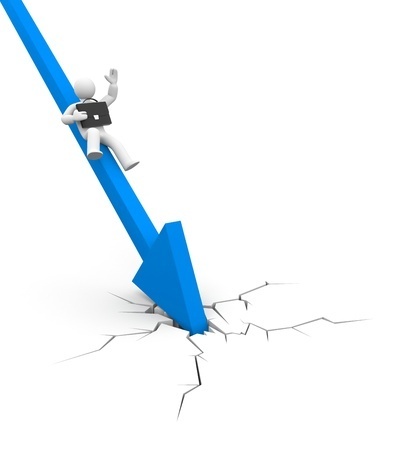 Gold and oil prices continue to drop. Greece’s persistent financial woes remain a drag on overseas markets. So, with all of this uncertainty, what should investors do? In case some of us are contrarian in nature, volatility can also breed opportunity. For starters, depending on whether the Federal Reserve raises the Fed Funds rate in a slow, minute manner or executes a one-off, Fed Funds interest rate increase, investors should attempt to capitalize on any bond market weakness today. Investors should start by gradually, but aggressively, picking up either taxable or tax free Municipal bond offerings where the spread over Treasury yields is attractive. In addition, the recent bond market volatility in Europe likely won’t deter their Central Bank’s Chief from continuing to purchase 65 billion Euros per month of government securities. This action might also put a floor on any European bond market route. Such a scenario can present buying opportunities for value investors. In our view, a value discipline of daily analysis for the optimum risk-reward sweet spot, along the yield curve, should enable investors to take advantage of the current bond market volatility. In a like manner, investors should consider looking at high quality growth businesses available at attractive prices. 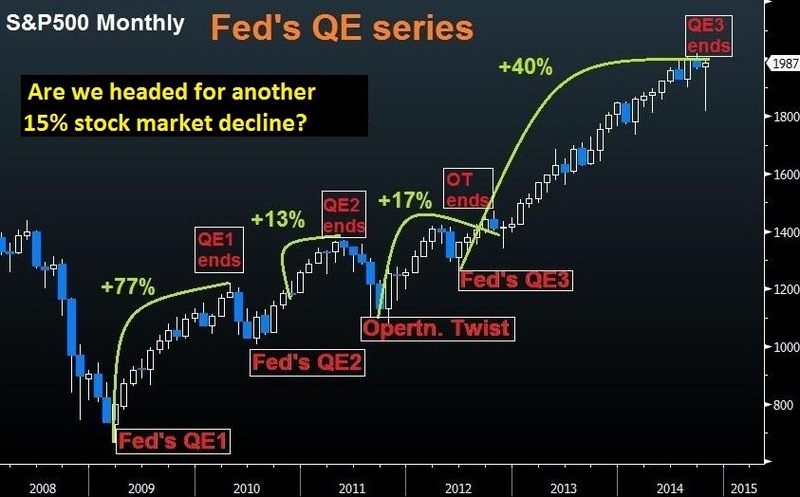 The End of QE, What Does It Mean To Financial Markets? With last week’s announcement by the Fed that it is ending QE (quantitative easing), some analysts are sounding like Chicken Little, worried about the effects of such a move on financial markets. In actuality, there are some reasons to be concerned; the market is not cheap with the S&P 500 trading at an average 17.6X earnings, world economies are facing near stall GDP growth rates and the U.S labor participation rates are at an all-time low of 62.8%. However, it is important to point out that the QE termination really took place about eight months ago, when the Fed committed to reduce its monthly $85 billion purchases of Treasuries and Mortgage-backed securities by a mere $10 billion a month. What the worrywarts haven’t recognized is that the Fed is sitting on some $4.5 trillion of these instruments previously purchased to keep mid to long-term interest rates low. At this point, the Fed intends to hold on to their portfolio and to continue investing its proceeds for as long as Fed Fund rates (short-term rates) remain at 25 basis points.